Think you only have to be concerned about the health of your teeth as a child or an older adult? Think again—especially if you have diabetes and are pregnant, are planning to become pregnant, or are of child-bearing age. Studies suggest that the health of your pregnancy may be linked to the health of your gums and teeth. 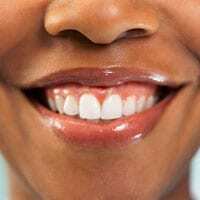 Recent findings show that women with diabetes are at higher risk of having gum disease. During the day, bacteria from foods you eat stick to your teeth and form a film called plaque. If you don’t remove plaque by brushing and flossing, it turns into hard tartar. Plaque and tartar can cause your gums to become red and swollen and bleed easily. Over time, gum disease may develop, causing bone loss and pockets that form around the teeth. These pockets can trap very small pieces of food and become infected. Bacteria in plaque from the mother’s mouth can enter her bloodstream and reach other parts of her body. This exposure to bacteria and its products may increase the risk of early delivery or get in the way of normal growth of the baby in the uterus. Have your teeth cleaned at least twice a year or sooner if your dentist advises more frequent cleanings or check-ups. Also see your dentist if your gums bleed, if they are tender or swollen, or if you have ongoing bad breath, as these symptoms can indicate disease. If you have diabetes, tell your dentist. In some people, gum disease has been shown to increase the risk of diabetes-related complications, such as kidney problems. There may also be a small but important improvement in blood sugar control from treating gum disease in people with type 2 diabetes. Knowing about your diabetes can help the dentist in the proper care of your teeth and gums for a healthy mouth and a healthy pregnancy. Avoid eating sugary foods: Especially as snacks between meals as these foods can promote tooth decay and cause rapid changes in your blood sugar levels. Avoid drinking sodas: Regular soda is high in sugar, and the acid in both regular and diet sodas can erode tooth enamel, especially if you sip soda throughout the day. Brush your teeth at least twice a day: Especially after meals and snacks. Floss at least once a day: Waxed and unwaxed floss work equally well but it may be easier to use waxed floss if your teeth are close together. Don’t brush your teeth after vomiting: Such as with morning sickness. Stomach acid in vomit can put your teeth at risk of wearing down. If possible, rinse with water, a baking soda/water mix (1 teaspoon of baking soda to 1 cup water), or a fluoridated mouth rinse. You can also chew sugarless gum, candies or mints. Drink fluoridated water: Taking a fluoride supplement, such as a tablet or lozenge, isn’t necessary. Don’t use tobacco: If you smoke, quit. Pregnant women who smoke may be more likely to have an early delivery or a low weight baby.